One of the greatest challenges of our Logistics Division is to find the solutions for boosting the efficiency of production and logistics systems. Production and logistical systems-related tasks represent the major part of the department’s work. Mainly, these are applied to find the unlocked potential and bottlenecks at systems and to help production (production equipment), and logistics resource utilization (stores, warehouses’ material handling equipment, workers). Because of the complexity of these systems, we carry out our inspections with an effective engineering design and modelling software, with which there is an opportunity of modelling processes of systems and simulation tests. 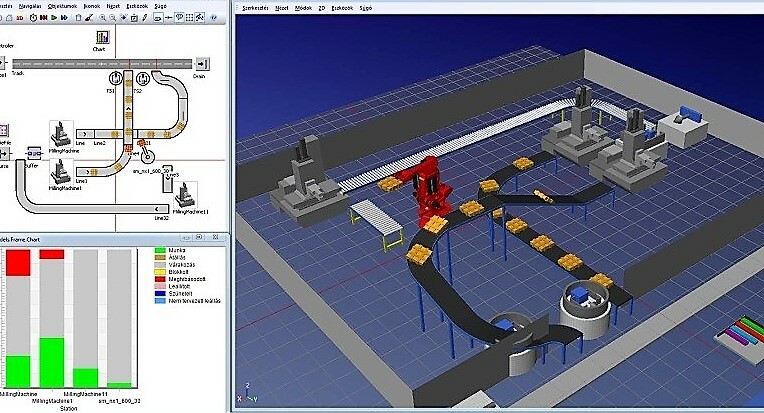 For tests, we use Siemens Plant Simulation discrete event simulation software, which is specially designed for modelling of production and logistical processes. In the last 10 years, we had several project works together with some Hungarian multinational companies (Audi Hungaria Ltd. Győr; Robert Bosch Energy and Body Systems Ltd. and Robert Bosch Power Tool Ltd. Miskolc; Magyar Suzuki Zrt. Esztergom). Beside solving all of the upcoming logistical tasks at the multinational companies, there is a huge demand for rationalization of production- and material supply processes, and more economical, and effective production at the SME sector (D&D Drótáru Zrt. Miskolc; Akzo-Nobel Ltd. Tiszaújváros; FlexiForce Ltd. Debrecen; Platt 2003 Ltd. Eger).